We have an amazing nursing team that holds everything together at Ashwood. They ensures the highest standards of medical care and have specialisms in surgery, anaesthetics, rehabilitation, kidney disease & dentistry. You may be surprised at what our nurses are qualified for, trained in and capable of! It was while watching episode after episode of Animal Planet that something clicked for me. We didn’t really have pets until I was 16, when we got a wonderful black lab puppy called Alfie. I’ve just recently rescued another lab puppy called Harvey and he’s crazy! (and super-happy). I just love to help animals in any way I can, and I love working at Ashwood with Patrick and the team. I love developing my skills as a Surgical Nurse and seeing the results of helping my patients live a better quality of life. I'm undertaking further advanced studies in nurse surgery and enjoying every minute of it. Since the end of my 3 years of academic nursing studies and qualifying as a registered veterinary nurse I really have never looked back. Norma grew up in Fermanagh and is the heart of the Ashwood team (she’s the sticky stuff that holds us all together) and has been here from day dot. She has previously had a career as a renal transplant nurse in the City hospital (she could tell you anything you need to know about kidneys!) and then went on to become a matron to the boys' boarding at Methodist College. 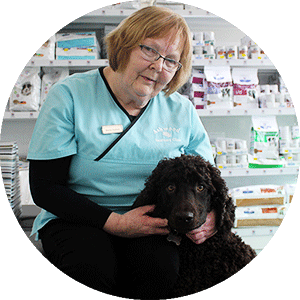 Norma is a busy bee, when she’s not in the prep room nursing our fluffy patients she’s at reception chatting to clients. In her spare time Norma loves gardening and enjoys going out for coffee with friends (she has a better social life than all of us put together!). Norma has owned cats all of her life and currently has a lovely big 3 legged feline called Archie who adores lazing about and sunning himself in the garden. From the grand age of 2 years old, I've always had a passion for animals great and small. My mum's purse was broken from buying me toy animal figures and farm sets. She even caught me a few times stealing all the toilet roll to bandage up my stuffed dog Biffa! My animal figures and stuffed teddies have now been replaced with my own personal zoo. I am the proud owner of 3 dogs, 2 cats, a chinchilla, and a horse. So when I come home in the evenings I am greeted with muddy paws, doggie kisses, kitty snuggles, small furry nibbles and horsey cuddles... which is great!! I'm part of the Ashwood family and I can't think of a better place to be as everyone is just as crazy about animals as I am! 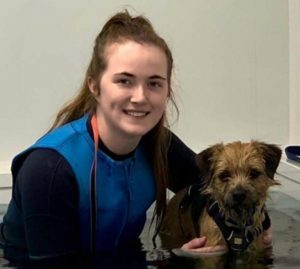 With our new rehabilitation hydrotherapy suite I can offer help and support to both pets and people and I am loving every minute of doing so. My four fur babies at home love to walk me to the beach for a gallop on the sand or a dip in the sea. Even though two of my beautiful Springer Spaniels, Molly and Kim are golden oldies, they still have an abundance of energy to rival the much younger Belle and Eddie the cocker cross. They really keep me on my toes. 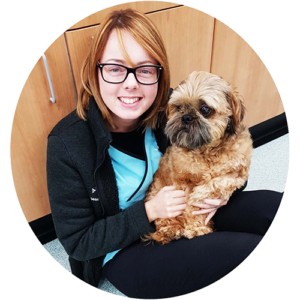 I joined the Ashwood team in 2018 and with my love for animals and high standards of care I feel it's just where I was always meant to be. 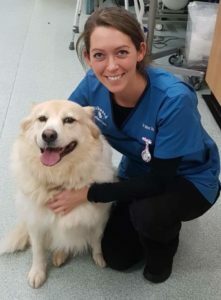 Having worked in Veterinary Nursing for 4 years, Aileen starts with us in April 2019. 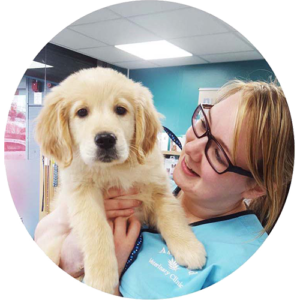 She is part way through the demanding three year professional Veterinary Nursing qualification. 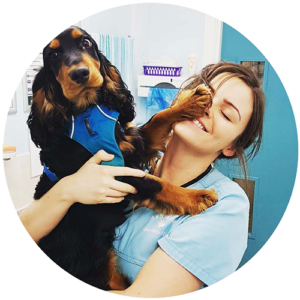 Having spent the last two years working in Stormont Vets4Pets, she is already familiar with many of our Dundonald folk and we're looking forward to her becoming part of the Ashwood family.